A group of fanatic illegal Israeli colonists invaded, Tuesday, Palestinian olive orchards in Wad Abu ar-Reesh area, north of Beit Ummar town, north of the southern West Bank city of Hebron, and cut hundreds of olive trees and saplings. 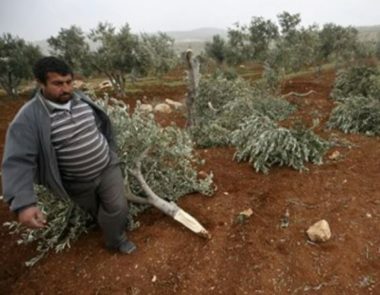 Yousef Abu Mariya, a nonviolent activist against Israel’s colonies in Beit Ummar, said the colonists cut hundreds of olive trees and saplings, owned by a local farmer, identified as Ibrahim Thalji, from Safa village, north of Beit Ummar. Abu Mariya added that the colonists have previously repeatedly invaded and cut trees in the orchard, and several surrounding orchards owned by Palestinians from Thalji and Sleibi local families. Despite the constant violations, the villagers continuously replant their trees and lands, and remain steadfast to prevent the illegal colonists from occupying them.